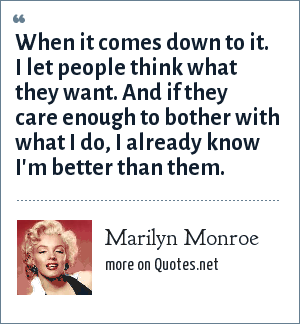 Marilyn Monroe: When it comes down to it. I let people think what they want. And if they care enough to bother with what I do, I already know I'm better than them. When it comes down to it. I let people think what they want. And if they care enough to bother with what I do, I already know I'm better than them. "Marilyn Monroe Quotes." Quotes.net. STANDS4 LLC, 2019. Web. 23 Apr. 2019. <https://www.quotes.net/quote/46949>.